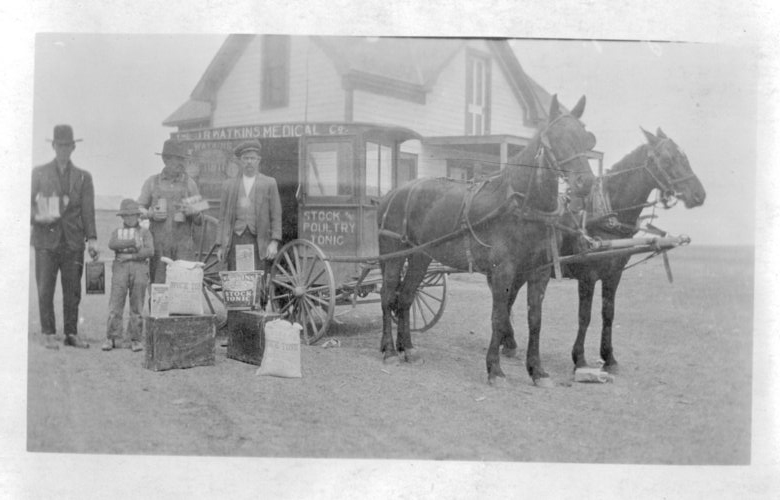 This black and white photograph shows a group of gentlemen, possibly a salesman and customers, standing beside a horse-drawn J.R. Watkins Medical Company wagon near Eureka, Kansas. There is also a young boy in the photograph. The company, founded in 1868 by Joseph Ray Watkins from Plainview, Minnesota, sold medical liniments and salves from the back of a horse-drawn wagon. One sign indicates they sell stock and poultry tonic. There are several cloth sacks and buckets on the ground beside the wagon.